I find that a lot of the teachings of Tibetan Buddhism really hit home with me, the ritual, the ideals, almost everything. 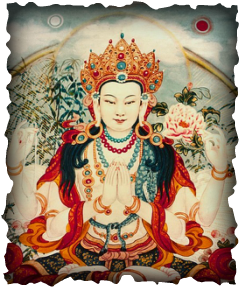 The main path that I incorporate into my spirituality is the Chenrezig path, or the Lord of Compassion. This path teaches that the only alleviation to evil, suffering and negativity is compassion itself. You cannot run away from things that seem to hard, you have to stick through and look at it from the perspective of compassion. In this form of Buddhism, compassion and enlightenment go hand in hand, to be enlightened is to be compassionate. During the service, the prayer of compassion is chanted for those who are suffering ,so that they may know compassion, to become compassionate and to reach enlightened so that they may no longer suffer. In the religion/spirituality, any one can attain Buddhahood, we all have the potential. Buddhahood is the ultimate form of enlightenment, the ultimate form of compassion and knowledge. This can be attained through meditation, prayers for self and others as well as being compassionate.